Karoline Leblanc was born in 1975 in Rimouski, Quebec (Canada) and from the age of 5 she started to destroy her parents’ piano. 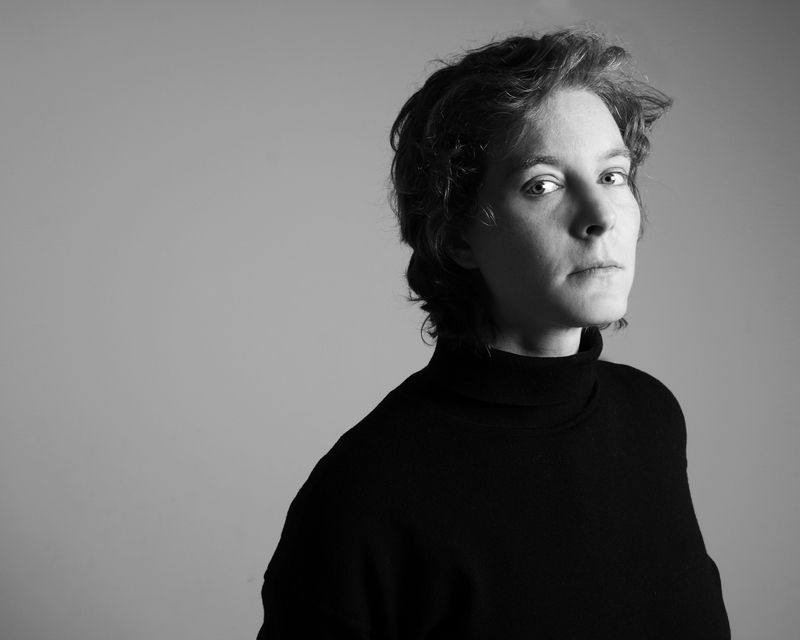 From 1983 to 1997 she studies violin, harpsichord, organ, Ondes Martenot, analysis and music theory at the Conservatories of Rimouski, Quebec and Montreal. She continues her canvas for two years at Concordia University in the advanced music performance program, and benefits from workshops with Ton Koopman, Arthur Haas, Bob Van Asperen, Hendrick Bouman, Jean-Patrice Brosse, Kenneth Gilbert, Pierre Hantai and Skip Sempe. In 1997, she wins the second prize, in duo with Olivier Fortin, at the international competition of the Festival Van Vlaanderen, Belgium. She has performed solo and in ensembles in places like the Massey Hall in Toronto, Salle Pierre-Mercure in Montreal and Provinciaal Hof in Bruggen. Captivated early on by contemporary classical music, she played many world premieres by Canadian composers. She received grants from the McAbbie foundation, Conseil des arts et des lettres du Québec, Beaulieu-Langis foundation and Festival du Comminges, that gave her the opportunity to deepen the early and the contemporary music repertoires. Since 1998, through intuiti personae sound meetings with improvisors, with traditional free jazz as starting point, she’s searching for new reactions and expressions in open forms fully devoting herself to the unconstrained, favoring the piano as her main instrument but also developing her take on various electronic instruments and percussions. Paulo J Ferreira Lopes is a drummer, improviser and sound artist born in Lisbon, Portugal in 1962. Founding member of “Ocaso Épico” in 1981 but also involved with other experimental rock groups throughout the Mid-1980s, he always chose to limit his stage appearances to those occasions when the music most actively relied on improvised elements. He later moved to Montreal, Canada, where he continues his uncompromising sound activities. He collaborated, among others, with such artists as choreographers Dominique Banoun and Michèle Rioux, multimedia artist Marcelle Hudon, filmmaker Pascal Maeder, sound artist Alan Bloor (Knurl), visual artist David Miller, violinist Vladimir Ulman, vocalist Sainkho Namtchylak, cellist Boris Raiskin, drummer Phil Giborski (FAT) and saxophonist Michael Fischer. Between 1992 and 1995, he was a member of A.M.I.M (Association des Musiciens Improvisateurs de Montréal), a collective that managed its own production space and the ”États Soniques” series, presenting an array of concerts by Canadian improvisers; the series were curated by Lisle Ellis, Michel Ratté and himself; the concerts were regularly recorded by CBC/Radio-Canada for their renown “Le Navire Night” broadcast. In 1998 he meets pianist Karoline Leblanc and they have been closely collaborating ever since, merging improvisational specifics and developing an idiom of their own. ANNE-F JACQUES lives in Montreal, Canada. She is interested in amplification, erratic sound reproduction devices and construction of various contraptions and idiosyncratic systems. 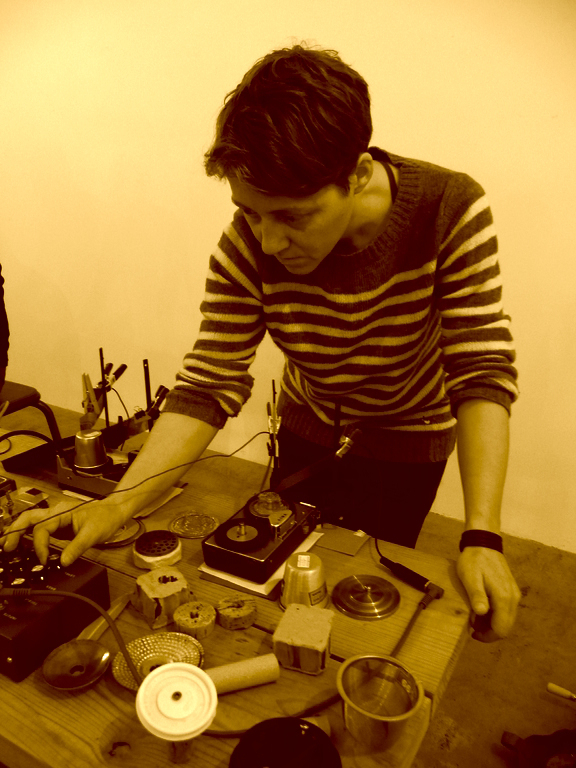 She often performs, alone and in various collectives (including Minibloc and Fünf), creates sound installations and makes soundtracks for Julie Doucet’s animated films. The use of low technology, trivial objects and rough sounds is particularly appreciated. Anne-F is also involved with Crustacés tapes, a postal sound distribution project. Artiste sonore résidant à Montréal, Anne-F Jacques s’intéresse aux choses qui tournent, aux systèmes erratiques et à la construction d’engins et patentages idiosyncratiques. Elle performe régulièrement, fait partie du collectif Minibloc (avec Nicolas Dion) et compose les trames sonores des films d’animation de Julie Doucet. Elle a présenté des installations sonores dans plusieurs centres d’artistes au Québec et des performances en Amérique du Nord, en Europe et au Japon. L’utilisation de technologie désuète, d’objets dérisoires et de sonorités rugueuses est particulièrement affectionnée.